WebOffspring » Where to find the best deals every day! 18 Groupon alternatives! Where to find the best deals every day! 18 Groupon alternatives! I’m amazed by the way Groupon has changed the way people see an age old scheme of coupons offerings. If you were living in an underwater city and you have just surfaced to solid ground and haven’t heard of Groupon before… then let me explain you what they do. Every day, every single day, they feature a new business… and this business is offering it’s products or services with discounts of up to 90%. How is this even possible? They do it by driving hundreds or even thousands of customers to it and thus achieving deep discounts based on volume. The business sets a threshold of purchases over which it accepts the deal and the customers keep coming in. So you… me and everyone else enjoys goods or services in never before seen prices and the business gets customer numbers that may have never seen before. So, the idea of coupons may be old… but the twist of collective buying power, the every day updated promotions and the razor sharp focus of the company to the simplicity of the whole thing brings huge profits to customers at first… and to Groupon itself at second. Deals can either be on consumer packaged goods, accessories, automotive related, beauty, Beer, Wine and Spirits, Diet and Fitness, Electronics, Entertainment, Fashion, Health & Pharmaceutical, Financial and Travel, so I’m sure everyone can find something of interest. Groupon is based on its huge, millions counting, mailing list that uses to let members know of each new deal. Deals spread through social media such as Twitter and Facebook which leads to new subscribers and customers every day. The usually high discounts, over 90% at times and the time limit (each deal lasts a day) which causes a feeling of urgency, make the site a success. 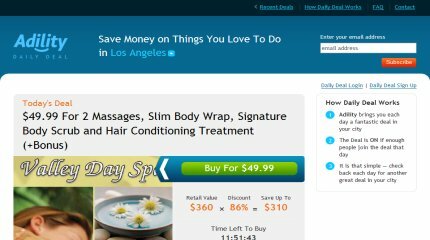 Groupon supplements all that with extra rewards every time you refer new members to the service, location based offerings to find the best deals in your own city and a programming API for users who want to integrate the offerings to their own site. All these build up a simple satisfying shopping experience that keeps users engaged checking the site for new offers every single morning. Groupon really is a new way for business to promote themselves which brings benefits to both suppliers and customers. Groupon itself earns money based on the very simple and profitable business model of pocketing a percentage of each transaction made. So.. everyone is happy. Even though the business model of Groupon is very interesting from where I’m standing… the discounts offered can benefit all of us, especially in a recession like the one we are going through. 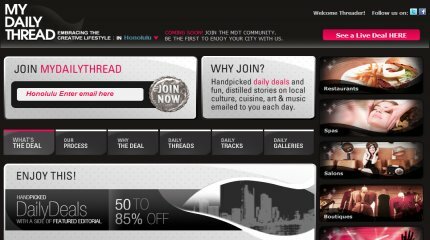 Since this is not a Groupon promotional post and the interest lies in finding other Groupon alternatives that exploit the benefit of the collective, group buying power, I’m compiling today a list of 18 group buying sites that you can visit to get discounts on the things you want to buy and keep those extra money in your pocket. 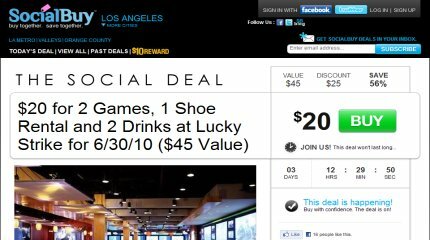 Living social exploits the group buying power to give you each day a new deal on a restaurant, spa or event. If you can refer three people who purchase the deal themselves you get your own deal for free. 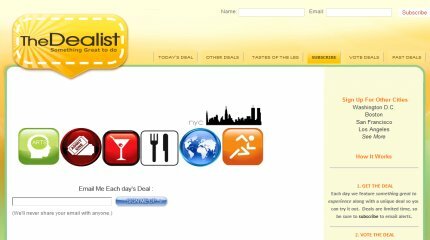 BuyWithMe is a daily deals site that uses the social web to promote its deals and gain customers. The concept is very similar to Groupon but the difference is that you get access to some previous deals as well if you find them interesting. 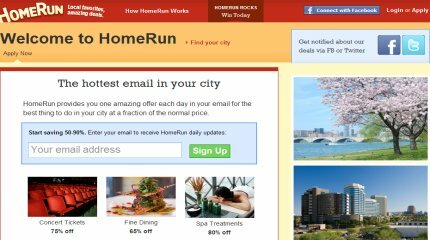 A group buying site similar to Groupon that offers great discounts to a number of US cities. An additional feature is the reviews of the customers that are already familiar with the product or the service offered to assist new ones on their purchase. 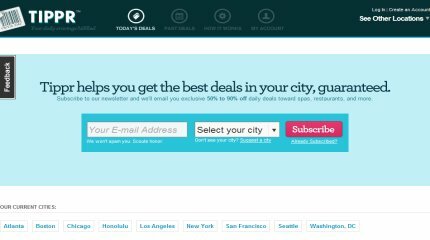 A quickly expanding daily deals site that emails you daily its new offers. You can also recommend your favorite local business to be featured on the site. 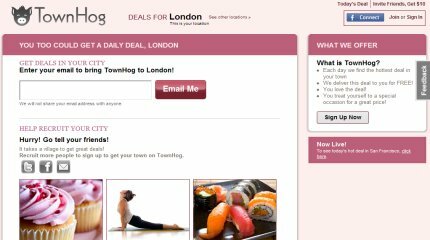 Groupola is a UK based site that offers daily deals for numerous UK cities. You can get 5 pounds for referring new members while there is more than one offer available each day. Every day WebPiggy offers a new deal to its members. If customers buy enough of the goods or services offered the deal is activated and everyone enjoys the discount. 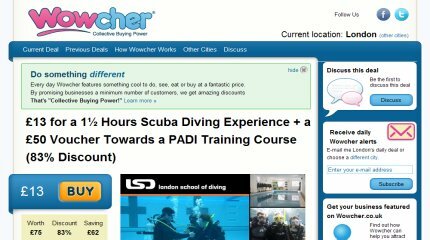 Wowcher is a UK only Groupon alternative. Each day a new deal, deep discounts, etc… you know the drill. Available in more than 40 US cities. Members are notified of deals daily and they can purchase a coupon that they can redeem at the merchant promoted. Daily deals site that notifies members through email for new discount offers. Every friend referred earns $10 towards a next purchase. A new daily deals site with a twist. The site uses various ways to give incentive to members to use the site by giving extra virtual credit for referring new members, purchasing coupons, etc which you can use for your next purchase or to access a special reserve of unique deals. 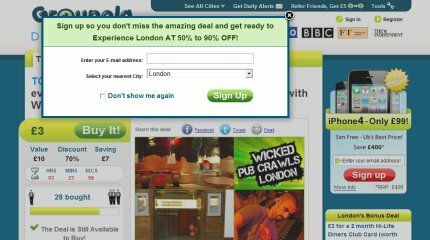 Based exactly on the Groupon concept, CrowdSavings exploits the group buying power to achieve deals that can benefit its visitors on a number of US cities. A group buying deals site that offers deep discounts on stuff offered each day. It also features live support, discussion forums, and a charities feature where a cut of the revenue is donated to nonprofit organizations. The Dealist features a daily offer for its members. 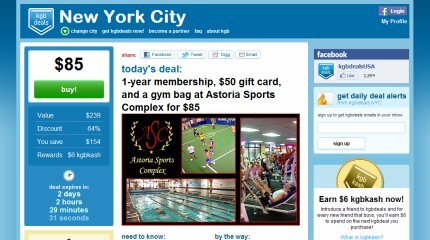 Based on the same concept as Groupon you buy a coupon that you can later redeem in the featured business. Currently the Dealist is only available in New York City. Another daily deals site with a big selection of cities. It offers rewards for referring new members and access to a number of past deals as well. Based on collective buying power Tippr manages to offer great prices everyday. Prices keep falling based on the number of people that join each deal. A daily deal site that starts with a discounted price and each new customer that joins the deal helps driving the price further down. At the end of the day everyone gets the minimum price achieved based on items sold. Daily deals offered on the site or through email alerts. Customers enjoy the discounted goods and they even get extra bonuses such as complimentary appetizers or drinks if total purchases are above a threshold. Every day flycoupon offers a new deal for its subscribers. Members enjoy deep discounts and can even read reviews on places featured from yelp as it is integrated in the site. Although not quite a daily deals site, EveryDayOffers.co.uk is a new alternative which is more like the Yellow Pages of deals and offers. What’s more all deals are purchased directly from the suppliers. So suppliers and customers deal with each other directly. Dont forget Gimme More Coupons, they have codes and coupons for USA< UK< Canada and Australia. Thanks for your visit and your suggestion! Please add our new site that was just launched October 1st. Australian users should check out All The Deals. We list all the Aussie groupon clones inc Scoopon, Jumponit, Spreets and all the others.